The Society was established in 1854 'for the investigation of subjects connected with the history and antiquities of the County of Surrey'. Despite subsequent changes in administrative boundaries, the Society's objectives remain substantially the same, and the present area of interest includes the historic county up to the Thames. 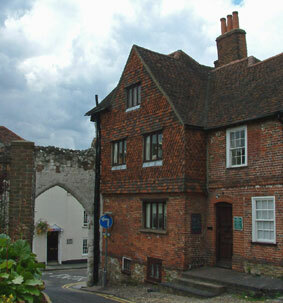 The Society's admin office is at Castle Arch, Guildford. The Society's Library, which includes a large and diverse collection of research material has now moved to our Research Centre in Abinger. See the library pages for details. Excavations and fieldwork are organised by the Society, the most recent major excavation being that of the Roman Villa at Ashtead. The Society, through its various representatives around the county, is constantly vigilant on behalf of the conservation of old buildings and archaeological sites of known importance. There is a large and enthusiastic Surrey Industrial History Group and other local and specialist groups are active within the Society. Publication is an essential part of archaeological and local history investigations, and the Society publishes regularly and distributes free to members the Surrey Archaeological Collections, a journal of reports, articles and notes on a wide range of subjects. In addition, special volumes and research reports are published from time to time. Society members also keep in touch through the regular publication (six issues a year) of the Bulletin. A list of Society publications can be obtained from the Society's office or from the separate publications list on this website. Symposia, lecture courses and visits are organised and well-supported. Membership is open to individuals or groups interested in the work of the Society, and applications and enquiries should be addressed to the Honorary Secretary, Surrey Archaeological Society, Castle Arch, Guildford GU1 3SX.